By simply uploading a PDF or Word document you can overlay a corresponding area for signing or add spots for recipients to initial. This means that even if the document you have has no line or field for a signature, you can choose where you'd like your client to sign or initial. You are not restricted by the fields included in the document and you could have their signature or initials included on multiple pages. With the addition of multiple recipients and multiple signatures to the FileInvite platform, you can also have primary and secondary applicants sign a document. This is great for signing loan documents or rental agreements where there are two or more applicants. You can also have it countersigned or include a spot for a witness to initial and sign. Matching the capabilities but offering a raft of other handy features to get documents collected and signed on time, many are considering ditching e-sign integrations and using FileInvite as an alternative. Their rational? Clients can seamlessly sign the document within their client portal. They don’t have to leave the platform to use an integration and sign documents. 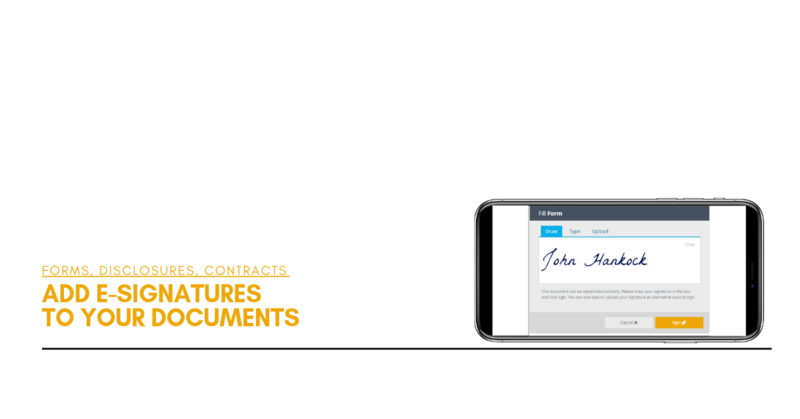 The adoption of e-signatures in recent years has rammed up and for legal purposes a verification certificate is appended to the document that verifies authenticity at the time of signing. Digital signatures, forms and document portals form part of a raft of features on FileInvite to streamline your document and information collection. Explore e-sign and all the other features of FileInvite with a free 14 day trial today!